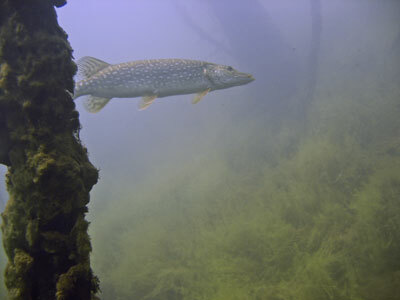 July 25, 2009: The first time out with my working underwater camera. First time out had a dead battery upon arrival. Think I have a bit of a learning curve. 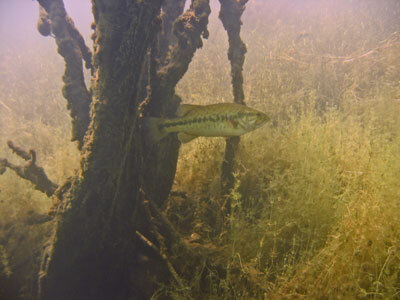 Did enjoy the bass near the underwater tree. Went out to Huntington Mine Pit near Crosby, MN to a site we call Connecticut Two Bit. About half way into the dive this northern decided to take a look at us. Had two dive partners this afternoon. Amy and Mike from Mankato. 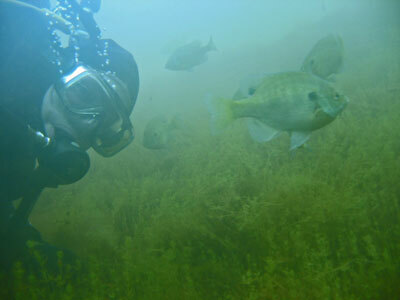 Toward the end of the dive Mike and I decided to spend some time with the sun fish. They were handing out by their fish beds and it was fascinating to watch them. There were dozens. 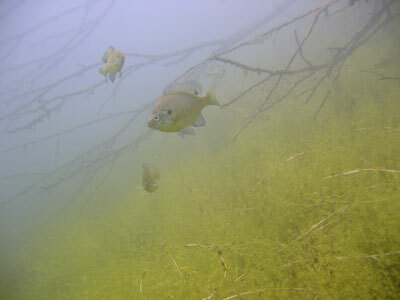 Thought this was a nice shot of a couple sun fish near more underwater trees and branches. This was a nice sized bass that hung around for quite a while, both as we were going out for the dive and on our return back to the entrance. 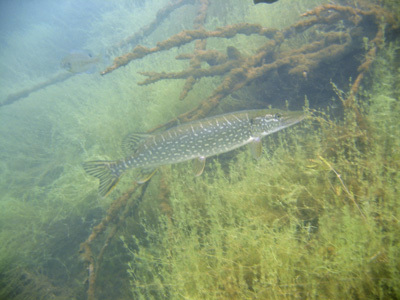 Another of the nice sized northerns we saw during our dive. E-mail August 1, 2009: Tell Paula I like her underwater photos. Jim in Baxter, MN.